December 10, 2009 - Garmin International the global leader in satellite navigation, announced that the Federal Aviation Administration (FAA) has granted an approved model list supplemental type certificate (AML-STC) for the Garmin’s TAS and TCAS I traffic systems, the GTS 800, GTS 820 and GTS 850. The initial AML-STC includes approximately 580 different aircraft makes and models and Garmin expects to add additional aircraft to the AML-STC in 2010. This announcement follows the technical standards order (TSO) authorization that Garmin received in November. The GTS 800 traffic series combines active and passive surveillance data to pinpoint specific traffic threats. The systems use Garmin’s patent-pending CLEAR CAS technology and correlates automatic dependent surveillance broadcast (ADS-B) with radar targets to provide pilots with the most accurate picture of the sky. “The GTS traffic series is one of several aviation products designed to be compatible with the NextGen system. It can track up to 60 targets at a time, identify the flight path of specific aircraft, and give spoken audio alerts in an ATC-like format so that pilots are able to react immediately to their surrounding traffic situation,” said Gary Kelley, Garmin’s vice president of marketing. There are three distinct system configurations for the GTS series, and each model creates a 360-degree zone of detection around the aircraft so that pilots can see and identify targets in their airspace that may pose a collision hazard. 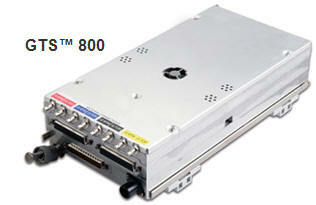 The GTS 800 TAS is a lower-cost system offering 40 watts of transmit power and a range of up to 12 nautical miles. The GTS 820 TAS delivers 250 watts of transmit power and up to 40 nautical miles of interrogation range. The GTS 850 TCAS I satisfies all TCAS I collision avoidance criteria for higher-capability turboprops and jets. It features the same 250 watt performance as the GTS 820, and also meets the FAA’s TCAS I certification criteria. The GTS 820 and GTS 850 are installed in conjunction with a Garmin Mode S transponder. All GTS series products include Garmin’s new CLEAR CAS (Correlated Location Enhanced ADS-B Receiver Collision Avoidance System) technology, a hybrid system that provides real-time information that is totally independent of radar-based air traffic control. CLEAR CAS combines active and passive surveillance data, including 1090 MHz Extended Squitter ADS-B data (ADS-B Out required). The system provides enhanced information that allows select displays to be updated to show flight ID, altitude, velocity, and direction of target aircraft. The GTS series also offers flexible antenna configurations that ensure optimum system performance for specific types of aircraft. Customers with fixed gear airplanes and rotorcraft may choose a single directional quadrapole antenna on top of the aircraft, with or without a bottom mounted omnidirectional antenna. For optimal performance on retractable gear aircraft, customers may select a top-and-bottom dual directional antenna configuration.